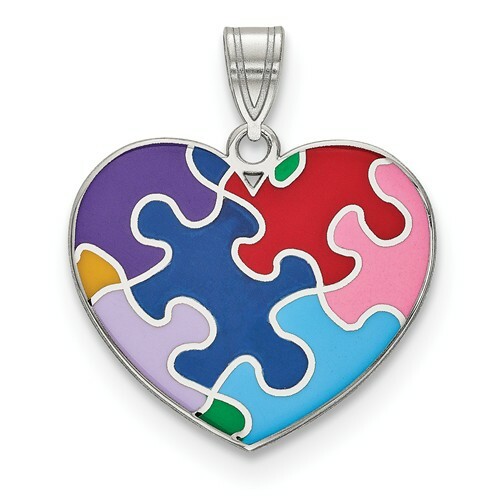 Made in .925 sterling silver, this colorful enameled autism awareness heart pendant is a great reminder to help spread autism awareness and it makes for a great gift for a friend, family member, or loved one! The autism heart pendant measures 3/4" in size or just over 1" tall inclusive of the hoop and bale. The opening of the bale measures 7mm x 4mm to accomodate your silver chain. You can also add a matching 1mm sterling silver chain in 18" or 20" to match. Shop our collection of autism awareness jewelry. We guarantee our Enameled Autism Awareness Heart Pendant, Sterling Silver to be high quality, authentic jewelry, as described above.